CBS This Morning senior correspondent John Miller, a former assistant director of the FBI, wrote this piece for CBSNews.com on the arrest today of Amine El Khalifi on charges of attempting to suicide bomb the U.S. Capitol. Sidi Mohamed Amine El Khalifi came to the United States on June 27, 1999 with his parents on a trip to Orlando, Florida. The baby-faced, brown-eyed Moroccan teenager would overstay his tourist visa and remain here for more than a decade, moving from Kissimmee, Florida to Northern Virginia. He worked at odd jobs and had occasional minor scrapes with the law, including a marijuana charge and traffic infractions. Khalifi stayed illegally, never applying for citizenship; he flew under the radar of law enforcement and immigration officials until the early days of 2011. FBI arrests would-be Capitol bomber outside D.C.
At an apartment in Arlington, Virginia, on Jan. 11, 2011, a confidential informant for the FBI's Counter Terrorism Division reported to his handlers that he watched as El Khalifi, by then, 28 years old, listened as another man said, "The war on terror is a war on Muslims." El Khalifi watched as the man produced an AK-47 rifle, two revolvers and ammunition, and discussed what the group needed to do to be ready to fight back. Over the next year, FBI agents, detectives from the U.S. Capitol Police, and other investigators from the sprawling Joint Terrorism Task Force that covers the National Capitol Region, kept close tabs on El Khalifi. El Khalifi allegedly kept discussing his desires to launch a terrorist attack. The investigators kept gathering intelligence. A major gap that needed to be closed was whether El Khalifi was connected with any overseas group. Was he part of a wider network? If we move in on him now, investigators wondered, will we miss people in the shadows who might strike later? One, that Khalifi was acting alone -- one of dozens of suspects who have sought to launch attacks on U.S. soil in the decade since 9/11. The other thing that became increasingly clear to the agents and detectives was that El Khalifi was determined to move forward. By the following December, they had introduced El Khalifi to "Hussein," who was cooperating with the FBI. On Dec. 1, 2011, "Hussein" drove El Khalifi to Baltimore to meet with a shadowy figure named Yusuf. Hussein told El Khalifi that Yusuf was a man who could help him realize his goal: To attack America. Yusuf claimed to be from al Qaeda, but was actually an undercover officer working for the JTTF. He talked with El Khalifi for months about El Khalifi's alleged plans. They ranged from attacking a synagogue, to a restaurant frequented by U.S. generals and admirals, and to a building in downtown Arlington that housed Department of Defense offices. Each plot offered its own challenges: Would he get past security? Would he hit the right targets? Should he use a gun or a bomb? In the end, he settled on a rare choice for U.S.-based suspects in terrorist plots: To be a suicide bomber -- the first terrorist suicide bomber on U.S. soil. His target would be the U.S. Capitol. According to the FBI, he went so far as to have a gun to shoot his way past Capitol police to get into the building so he could detonate himself inside the Capitol building. When Hussien, Yusuf and El Kahlifi had tested a bomb in a quarry on Jan. 15, 2012, El Khalifi allegedly told the men he believed to be his al Qaeda handlers that he wanted more explosives, a bigger bomb -- if not enough to destroy the whole building,at least enough to kill 30 people. He also asked that Yusuf have a remote-controlled trigger connected to a cell phone so that if he was captured by the Capitol Police and held down, Yusuf could still detonate the bomb by remote control. 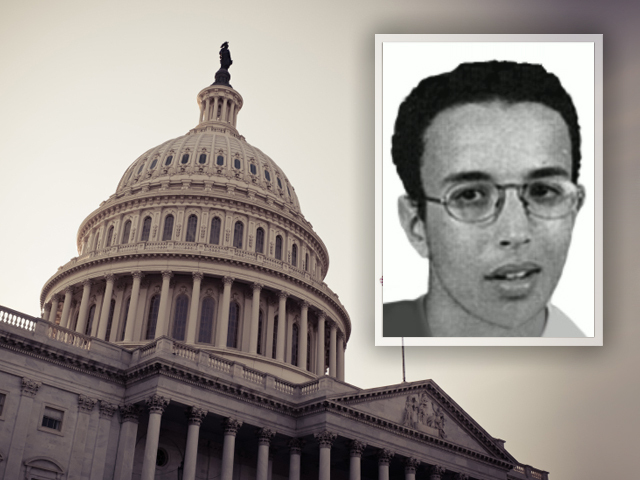 Sidi Amine El Khalifi is one of over a hundred suspects who have been arrested in terrorist plots targeting the U.S. at home or providing assistance to plots overseas since Sept. 11, 2001. The FBI and intelligence officials say that while there was an average of four to six cases a year from Sept. 11, 2011 until 2008-10, when there was a sudden spike of a dozen cases. The spike continued until 2011, when there were five attempts. Intelligence analysts at U.S. and foreign intelligence agencies launched ambitious joint project to examine what was causing the spike after the failed attempt by the so-called "underwear bomber," Umar Farouk Abdelmutallab, to blow up U.S. Air Flight 252 over Detroit. While the findings remain largely classified, the clear message that emerged from the study was that al Qaeda and its affiliates had identified a handful of messengers who seemed to connect and resonate with their messages of radicalization much better than al Qaeda leaders like Iman al-Zawahiri or even the late Osama bin Laden. Chief among them was Anwar al-Awlaki, an American-born cleric who once associated with two of the 9/11 hijackers. Al-Awlaki, after his release from prison in Yemen, became a prolific poster of videos on YouTube. Al-Awlaki's videos covered everything from Islam to health, diet, exercise and family life. But many of his messages had to do with Jihad and the obligation of young men to fight against the U.S.
U.S. intelligence authorities pressured YouTube to take some of the videos down, citing comments made by suspects like attempted Times Square truck-bomber Faisal Shazad, who told the FBI: "When I watched Anwar Awlaki on video, I thought he was talking to me." Awlaki's also had a direct role in recruiting the so-called "underwear bomber" in Detroit and exchanged emails with Major Nidal Hassan, the Fort Hood shooter who is facing trial in the deaths of 13 people in 2009. After Awlaki's death in a U.S. drone strike in Yemen on Sept. 29, 2011, some felt that the compelling message he used to drive radicalization might be dampened; and as the number of plots has declined since then, that may be so. Still, Friday's case tells us that the half-dozen key messengers and the messaging techniques of al Qaeda and its affiliates is a sophisticated process that continues to reach people who seek it out. As one intelligence official also pointed out today, "Awlaki may be dead, but his videos and audios are still all over the Web, and in that way, he never dies."